Switching on the Pump: Mr Thomas Rosengrave, President of Muintir na Tire, switches on the pump for the water scheme at Abbey, Loughrea. Also in the picture are from left: Mrs Maidie Conroy, Very Rev Fr Michael O'Reilly, PP, Abbey, Mr Vincent McDonagh, Secretary of the Group Water Scheme. Official opening of Kylemore/Abbey Group Water Scheme, July 1970. Back row L-R: P J Pierce, Michael Dolan, John M Larkin, Michael Burke, Des Lynch. Front row L-R: Bernie Conroy, Vincent McDonagh Secretary, Michael Dervan. The Kylemore-Abbey Group Water Scheme dates back over forty years. In July 1970 Thomas Rosengrave, the National President of Muintir Na Tire, opened the scheme. It was the first rural Group Water Scheme to have its own reservoir. Originally designed for sixty houses, the overall cost was about £10,000 pounds or €12,700 today. 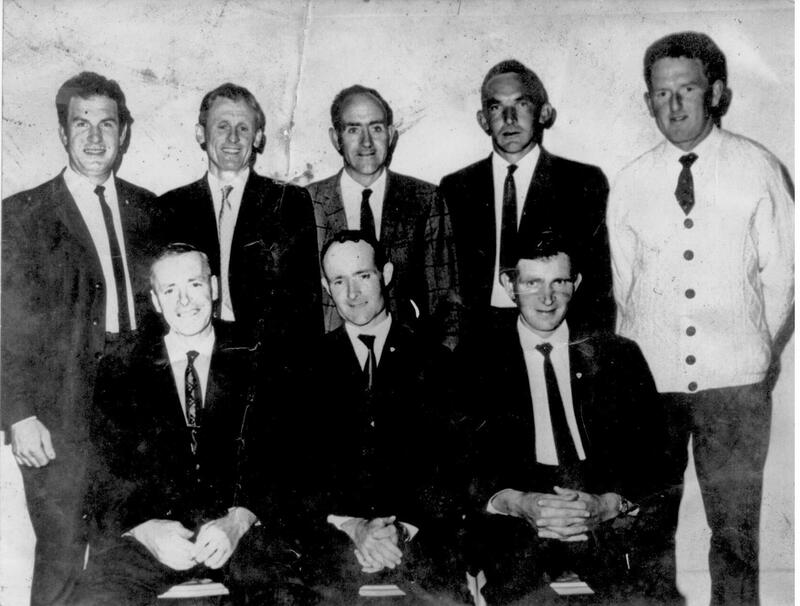 In the late 1960s when the local branch of Muintir Na Tire was in the process of completing its first major project, the building of a new Community Centre, a committee was formed from within Muintir to research the idea of forming a Group Water Scheme. At that time most families got their water, transported by bucket, usually from a shallow field well. Very few families had a piped water supply from their own well. A committee was formed and the first step in this project was to find a suitable supply of water. 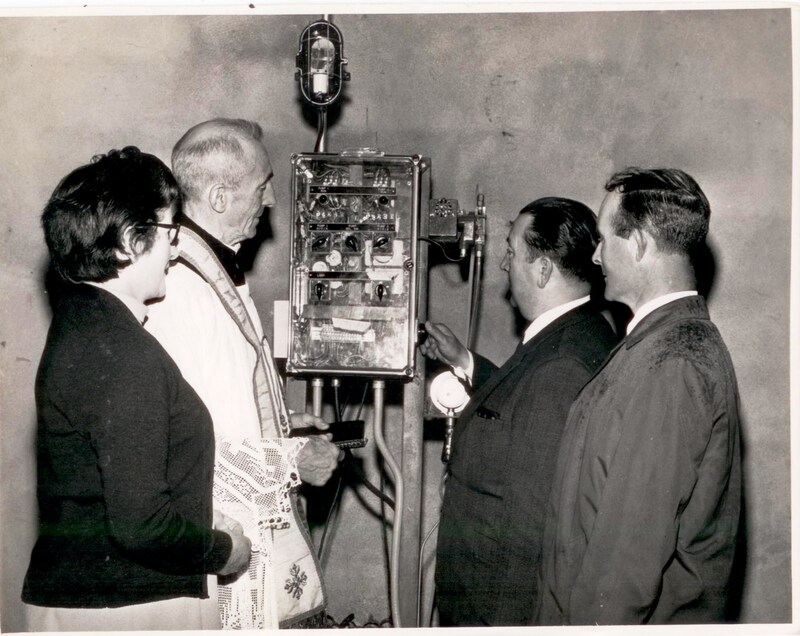 At that time there was a national organisation called ‘Save the West’ headed by Fr McDyer from Glencolmcille, Co Donegal. This organisation was instrumental in bringing groups of people, mostly Irish immigrants, to the west of Ireland to help local organisations to develop their areas. Fr McDyer’s organisation was contacted and as a result a number of people arrived in Abbey in the summer of 1967. They became guests of a number of local families for about two weeks, which probably became their annual holidays for that year. Permission was received from a local land owner in the Wellpark area to check for a water source on his lands. Local volunteers were joined by the visitors, spades and shovels were secured and holes were dug in the land owner’s farm in an effort to find a supply of water. This was the start of what is now a modern water supply with water mains infrastructure of 8.5 miles, and a reservoir with the capacity for 84,000 gallons of water. State funding of 66% was available for the development of Kylemore-Abbey Group Water Scheme. While this funding was essential, the project could not progress without the contribution and cooperation of the local people. They gave it great support at a time when nobody really knew how successful the project would become. The Group Water Scheme committee’s first secretary, Vincent McDonagh, played a major role in the project. His hard work and perseverance enabled us to access and benefit from the information gained from other Groups, mostly from outside the county, who themselves had already developed group water schemes. A lot of credit therefore is due to Vincent. Credit also goes to the late Bernie Conroy who made his land available to this zealous group, some of them total strangers, becoming acquainted with manual work for the first time in their lives. He was the land owner who permitted this development to begin by allowing holes to be dug in his green fields until a number of shallow springs were located enabling the project to proceed further. In 2001 the original water source was replaced by developing a new 300ft deep bore hole which is now the supply source and also replacing the water mains and the old reservoir. 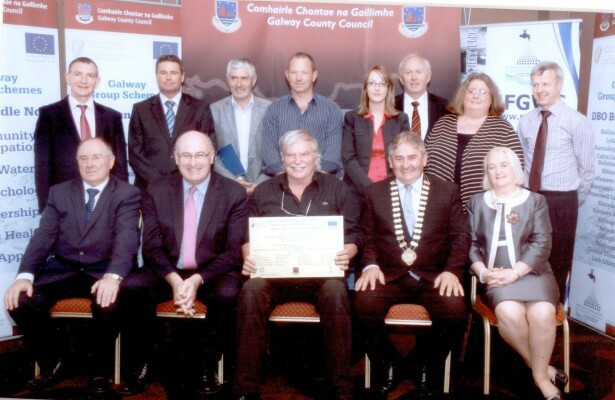 In January 2010 the committee decided to join DBO Bundle 2 in County Galway. This involved the construction of a new water treatment plant to be operated by an independent contractor on a twenty-year contract basis. This scheme was officially opened by Mr PhiI Hogan TD, Minister for the Environment, Community and Local Government on 1st June 2012. The scheme now supplies water to 140 houses all of which have been fitted with an individual water meter. Back L-R: Jim Cullen, Karl Zimmerer, John Diskin, John Kelly, Karen Carney, Michael Joyce, Catriona Devaney, Sean Clerkin. Front L-R: Brendan O’Mahony, Minister Phil Hogan, Noel Conroy, Clr Michael Maher, Martina Moloney.